The DeWALT DCK240c Combo Kit consists of a 0.5-incg compact drill driver, a 0.25-inch impact driver, two Lithium-ion batteries, 20-volt charger and contractor bag. Get all your drilling work done in a quick and hassle-free manner with this tool combo kit. Used on several projects and good quality for the money. 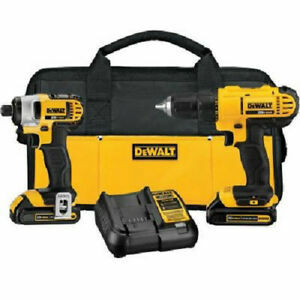 I ordered this dewalt set mainly because of the price, so far the quality seems to be good. I use drills and impacts occasionally for work, so they don't get non stop use. For the price I would say go for it, I looked around at several pawn shops before ordering and this set is a good deal. Add to that the refurbishing and warranty and it's a win win. If your a metal worker or someone that is going to run these non stop you may want to look at something a little more heavy duty. The drill was exactly as I expected. Since I have other DeWalt cordless drills, however the 20 volt drill has more power. The impact on the other hand impressed me very well. It is amazingly light, strong and compact. I would highly recommend an impact driver for any DIY project. This DeWalt feels good and balanced in your hand. Don't take it's small size for granted, it has lots of tork. Looks like new, smells a little burned! When i got this drill, it virtually looked brand new. However, when i started to use it, it really smelled like it had previously burned up. The hot air coming from off the electric motors was very burned smelling. I'm hoping that won't be a foreboding of the future. I'm hoping the smell will eventually dissipate.